Just a 15-minutes boat ride from the airport, Taj Exotica is one of the most convenient and easy to reach yet unspoiled and intimate. The stunning resort is renowned for its excellent service and top-notch gourmet food. These thatched roof bungalows come with a comfy space, a personal butler, private pool and soaking tubs in front of a stunning view of one of the biggest lagoons of Maldives. Apart from the basic facilities, there is a water sports-centre, a library, spa, PADI recognised Dolphin base dive, indoor and outdoor games, and a gift shop. Location: Only 8 kilometres south of Malé International Airport, Taj Exotica is located on Emboodhu Finolhu Island on South Male Atoll. Activities: Snorkelling, diving, fishing - big game and casting, sunset cruise, Male historical excursions, beach volleyball. The 45 overwater bungalows stretched over sparkling lagoon are no less than a paradise on earth, bathing in luxury. There are 7 villa categories to choose from. The spectacular villas with spacious yet sombre living space and a rooftop sun deck are reached by boat. Get ready to lose all stress in the pristine environment of the island and the meditation, yoga and spa centres that are a part of the resort. There is a fitness centre, pool table, library, organic garden, gifts and jewellery shop, Jungle cinema etc. for recreation. Location: Nestled on the private island of Lankanfushi in North Male Atoll, which is just a stone throw away from Velana International Airport and 25 minutes away from Male City by speedboat. Activities: Apart from good diving, snorkelling and surfing conditions, the resort also offers windsurfing, catamaran sailing, water-ski and wakeboarding lessons. Excursions, voyages and cooking classes are also arranged. If you think all the water villas look almost the same, then you might want to know about the unique water villas on the Cocoa Island - designed like the traditional Maldivian boat 'Dhoni'. These villas have all the modern amenities inside and not to mention, a fabulous view outside. 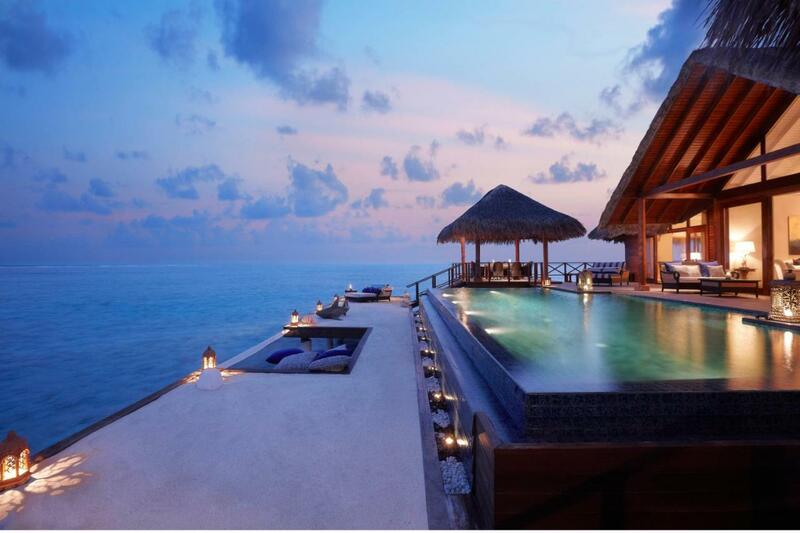 Although perfect for couples honeymooning in Maldives, the resort is also a kid-friendly place. Some of the facilities and services offered by the resort include COMO Shambhala Retreat, spa, meditation and relaxation area, water-sports centre, COMO the shop, Book/iPod/DVD library and restaurants and bars with some of the best dining in Maldives. Location: The resort is located in Makunufushi, South Malé Atoll, which is about 32 miles from the Male International Airport. It can also be reached by a 40-minute enjoyable speedboat ride. Activities: Water sports activities include diving, house reef snorkelling, game fishing, sailing and windsurfing lessons, etc. Complimentary equipment rental is available. Some of the family activities are marine talk and sunset cruise. If you're looking forward to having a 5-star luxurious stay in an exquisite overwater bungalow with your family, Kanuhara Resort is the place for you. The resort features 20 overwater villas equipped with all the first class amenities one would expect, including a private host, outdoor shower, sundeck connected to water below, and a balcony. The resort has a kids' club and offers other fun activities for the younger ones including fun tubes, a games room, beach volleyball, and tennis. Apart from that, a library, separate steam room, lifestyle and spa boutique, dry sauna, cold plunge pools etc. are available. Location: The resort is situated at the eastern edge of the Lhaviyani Atoll, some 100 kilometres north of Malé, and a beautiful 35 minutes seaplane ride away from the Male International airport. Activities: Freshwater swimming pool, Sun Dive Centre (PADI 5 Gold Palm certified), snorkelling, windsurfing, water surfing, water skiing, speedboats, land games, squash, aerobics, fishing tours, island hopping, sunset cruises. Wake up to a surreal view of the ocean every morning, while your stay in the deluxe overwater bungalow at Anantara Veli Resort, which offers a lavish living area, a private double terrace and sundeck for supreme lounging and a plunge pool overlooking the turquoise waters. Stairs from the room lead directly to the warm waters below where you may spot the sea turtle if you are lucky! Don't forget to enjoy the diverse food options, spa, and the complimentary boat ride to Dhigu Island. Apart from that, the resort houses a fitness centre, a boutique, a library, tennis courts, and offers an array of exciting activities that provide the perfect blend of leisure and adrenaline rush. Location: About half an hour from Male Airport, the resort is located in Veligandu, South Male Atoll. Activities: Snorkelling- encounter dolphins, mantas, whale sharks, turtles, Yoga and meditation, jet skiing, jetpacking, kitesurfing, wake and knee boarding, spice spoon cooking classes, Male excursions. 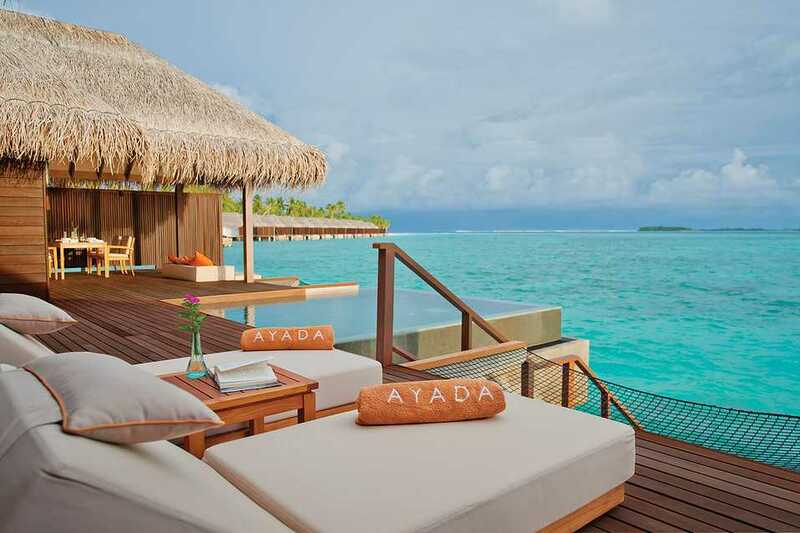 The various awards and recognition boast of the top luxury and excellent service that is provided by Ayada Maldives. The traditional thatched roof water villas come with an expansive living space, a private pool, a butler, an upper floor terrace providing serene 180 degrees view of the ocean and absolute privacy. You can take part in any of the numerous activities offered by the resort, play tennis or badminton or hit the 24 hours gym. For the foodie in you, there are six restaurants and bars to choose from, and a spa set in beautiful gardens for the relaxation seeker. Sleep in the ocean hammock, over blue turquoise water and under a starry night - just perfect! Location: Located 430 kilometres south of the capital Male, the resort is situated in the relatively unexplored Ghaafu Dhaalu Atoll, Maguhdhuvaa Island. Activities: The location of this resort facilitates outstanding snorkelling and diving opportunities. Some of the best surfing breaks can be reached by making a quick speedboat journey. Learning Yoga, going on an excursion or a fishing trip are some other good options. With a total of 286 rooms and suites, out of which 106 are overwater villas, Meeru Island Resort is one of the largest resorts in the tropical island nation. Their full-board (no alcohol) and half-board (breakfast and dinner only) options, other than all-inclusive option make it affordable for all tourists. This large private island offers more than a dozen restaurants and bars and an array of water sports activities among other services. Location: 40 kilometres northeast of Malé International Airport, the resort is located on the Meerufenfushi Island on North Male Atoll. Activities: The resort offers almost all the water sports activities one can imagine and some land-based activities like table tennis, badminton, beach volleyball, cycling etc. ; go on excursions or a sunset cruise and enjoy the nightly entertainment programmes. A stunning view of ocean coupled with a crisp, fresh breeze outside and a cosy living space amid cream and pastel décor giving the contemporary tropical feel. 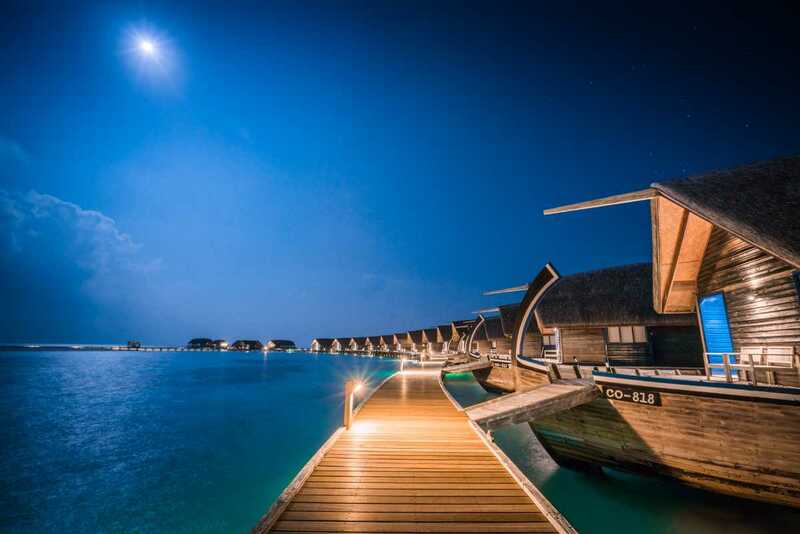 The overwater villas at Adaaran Club are one of the cheapest you can find in Maldives, with its prices dropping as low as MVR 5,700 in the low season. You can choose the full-board option if you don't drink alcohol and don't want to pay for others! You will get your private sun-deck and in some units, an ocean viewing glass floor cut-out but no WiFi. Some of the resort features include - dive shop and diving school, beach games, resident DJ, boutique, gem and jewellery shop, etc. The Adaaran club is famous for its scheduled nightlife. Location: Some 45 minutes speedboat ride away, the property is located on a small island Rannalhi in the South Malé Atoll. Activities: Catamaran, canoe and banana-boat rides, windsurfing, water skiing, water aerobics, beach games, morning and sunset fishing, island hopping and Male city tour, sunset photo cruise. For those seeking a paradise like tropical island vacation at affordable prices, this one is an ideal choice. Stay in the comforts of a king size bed, private porch, open-air bathroom with rain shower, and a white sand beach, and enjoy the various facilities available in the resort like water sports centre, fitness centre, spa, freshwater infinity swimming pool, volleyball, badminton courts and a football pitch. This is a perfect option for honeymooners who don't have unlimited funds and also provides a few options for children and families. Location: Located on the Veligandu Island, North Ari Atoll, the resort is 45 km away from the Male International Airport. Contact the resort for a seaplane transfer which takes around 20 minutes to reach. Activities: Activities include water sports like windsurfing, sailing, catamarans, kayaking, surf biking, snorkelling and scuba diving. Fishing excursions, island hopping, sunset cruising and day trips to Rasdhoo Island are also arranged. 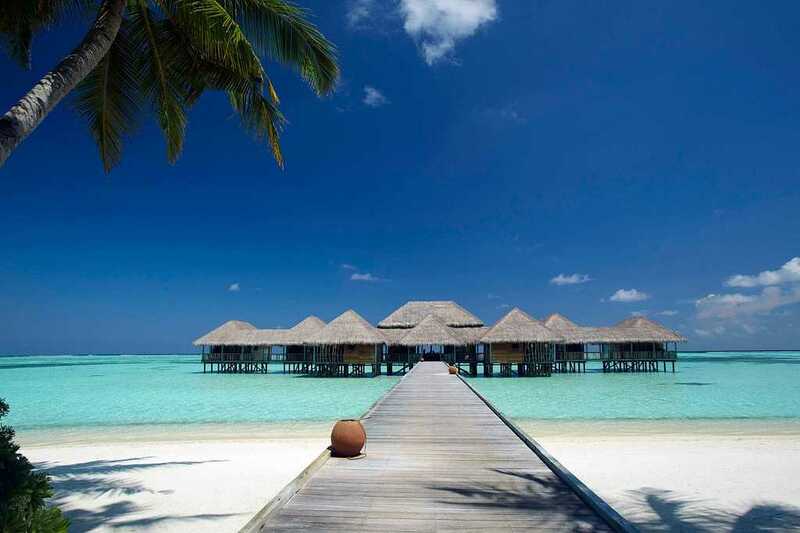 Formerly known as the Hilton Maldives, Sun Siyam Iru Fushi is a 5-star luxury resort with 80 private and quite secluded water villas which are great for both honeymooners and the solo peace seekers. The resort provides a wide range of restaurants & bars and a long list of activities. Of course, there's spa to relax. Apart from excellent service, the resort is also praised for its luxurious living space with all amenities, especially the glass flooring located right next to the bed giving a stunning ocean view. Location: The resort is located in the Noonu Atoll, 170 kilometres north of the main island of Malé and a 45 minutes long seaplane journey away. Activities: Apart from water activities like fishing, jet skiing, scuba diving, snorkelling, water skiing, windsurfing, the resort also provides other facilities like a paddle tennis table, tennis court, sauna, fitness room, sightseeing tours, island hopping. 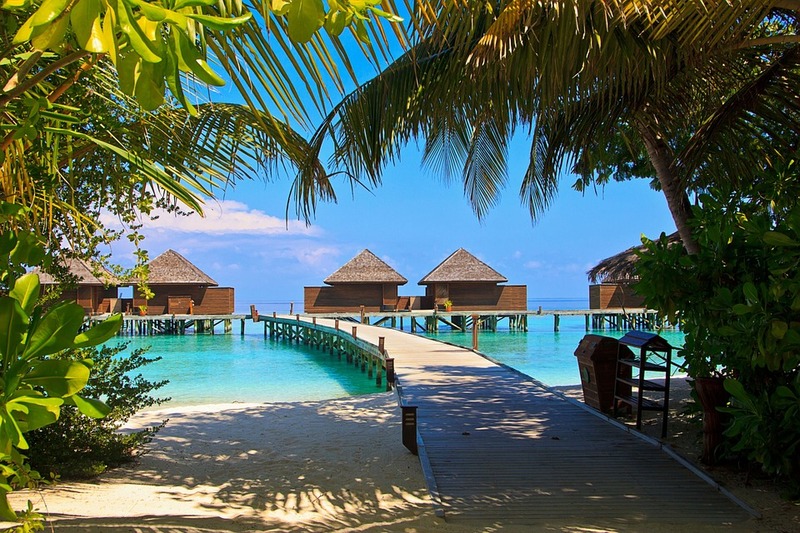 Sojourning in an overwater bungalow is a phenomenal experience in itself, and when it's in a place as beautiful as Maldives, it's no less than a paradise. Now you can choose from these different resorts with overwater villas according to your needs and convenience. Enjoy your stay! 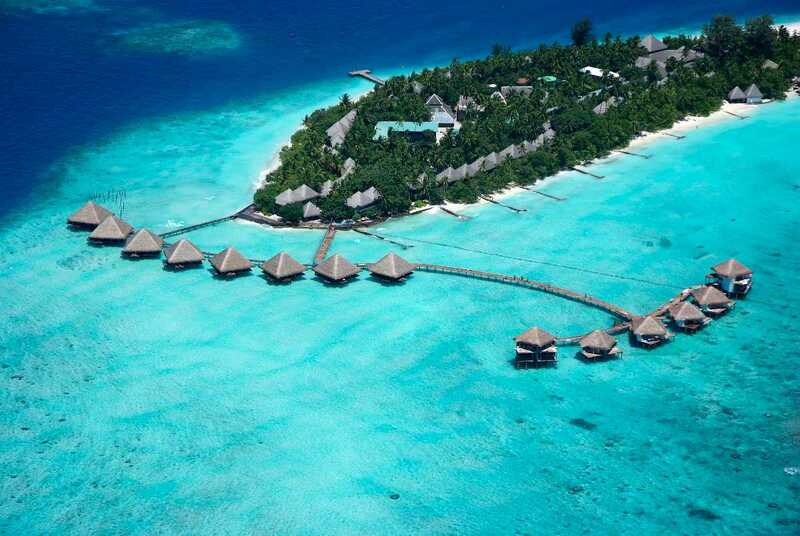 Bora Bora vs Maldives: Choose Between the Two Paradisiacal Lands ! Mauritius Vs Maldives - Which One Is Your Next Holiday Destination? Maldives Visa for Indians - Decoded & Simplified!